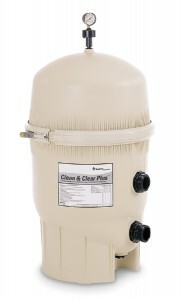 Clean & Clear Plus Filters have a corrosion resistant injection molded filter tank featuring superior strength and reliability. The cartridge assembly uses four easy to clean, non-woven, polyester cartridges. Each filter is supplied with a bulkhead union set for easy installation.Water flows very efficiently through Clean & Clear Plus Filters allowing the use of smaller pumps or lower pump speeds to minimize energy use. And through rinsing the cartridges rather than backwashing, you are significantly reducing your water use, too.